Orange Oil (Brazil) - Ultra International B.V.Ultra International B.V. The USDA forecast for the new Brazilian crop for year beginning July 2019 is estimated at 435 million boxes. This is a marked improvement, representing an increase of 50 million boxes or an increase of 13% compared to the current year, 2018-19. These are general estimates, and a better indication will be available by the end of March since the current orange season closure is June 2019. The recovery of citrus trees and favourable weather patterns are the main reasons behind the improved forecast. The current crop estimate has been revised downward from 393 to 385 million boxes. This is because the fruit size is smaller and there was above-average droppage in the key growing areas. This crop was stretched with some fruit coming in from the second and third blooming. The disappointing aspect was that the extra fruit did not meet required specifications and consequently, orange oil production fell short of original projections. The research group Fundecitrus, which represents Brazil’s largest orange processors, reported the 2018-19 crop in the two main regions of São Paulo and Minas Gerais of 285 million boxes (of 40.6 kg each), a reduction of 30% from the 2017-18 crop, Meanwhile the USDA zeroed in on 280 million boxes. Though the crop has been markedly smaller, the trees have experienced less stress and are in good health to produce more fruit. The weather was conducive, with adequate rains and ideal soil moisture during the blossoming period. Considering these favourable factors, USDA predicts a very good crop rising to 330 million boxes. Hopes for a better crop are being pinned on the next season, which will begin in July 2019. According to CitrusBR, Brazilian orange juice production should total just 874,000 MT in the 2018-19 crop year that ends in June, a 27.5% decline from the previous season, although industrial yield was better than the previous year. Most of the big players have already finished processing and are now involved in the preparatory maintenance for next season. January brought in some exceedingly high temperatures in the citrus belts, and this affected the processing pace considerably. Excessive rains followed this during the last week of processing. Consequently the numbers for fruit crushing were greatly reduced. 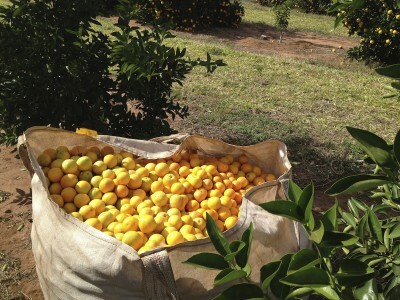 The market believes that global Brazilian orange juice inventories will tighten by the end of this season in June 2019. With regard to orange processing, the USDA estimates that 264 million boxes will be processed during 2018-19, compared with 395 million boxes in 2017-18. The preliminary estimate for 2019-20 is 313 million boxes based on the substantial forecast growth in orange production. Brazil dominates global orange juice exports but faces the challenge of falling global demand alongside increased international competition from countries such as Mexico. The higher production forecast has led to a softening of both orange oil and terpene prices, which are at their lowest for 5 years. Demand for both orange terpenes and d’limonene has fallen, in part because of substitution of dipentene in certain end uses as well as efforts to reduce dependence on d’limonene because of its price volatility and reduced supply over recent years.